(b. 1982) – a Ukrainian writer and translator. In 2004, she stayed in Krakow as a writer in residence under the Homines Urbani scholarship. She has translated works by Manuela Gretkowska, J.K. Rowling, Nick Davies, Gregor Dallas, Peter Taylor into Ukrainian. 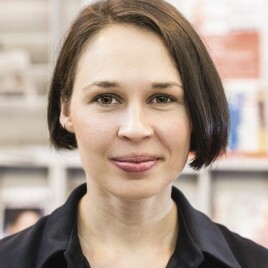 In 2014, she won the BBC Ukrainian's Book of the Year award for the novel Фелікс Австрія, which was published in Poland under the title Felix Austria, as well as her other two books: Siomga and Their Men's Women, by Wydawnictwo Czarne. In 2015, she received the Joseph Conrad Korzeniowski Literary Prize funded by the Polish Institute in Kyiv.